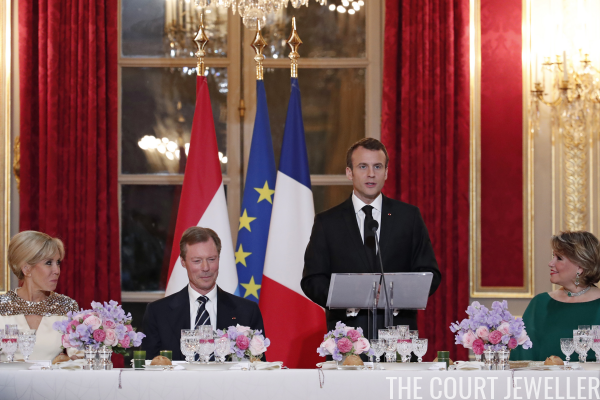 Grand Duke Henri and Grand Duchess Maria Teresa of Luxembourg are currently on a state visit to France, where they were the guests of honor at a state dinner on Monday evening. 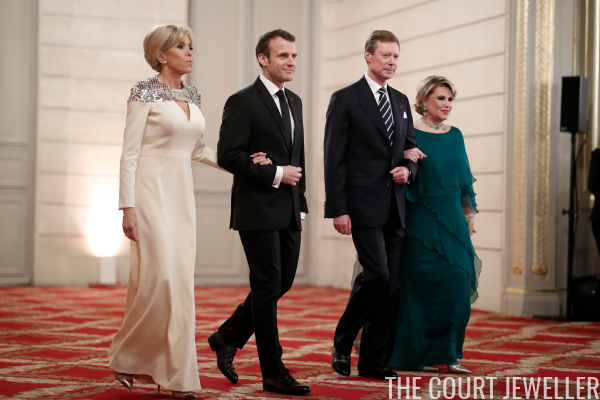 President Emanuel Macron and his wife, Brigitte, were hosted the grand ducal couple at the Elysee Palace in Paris for the dinner. 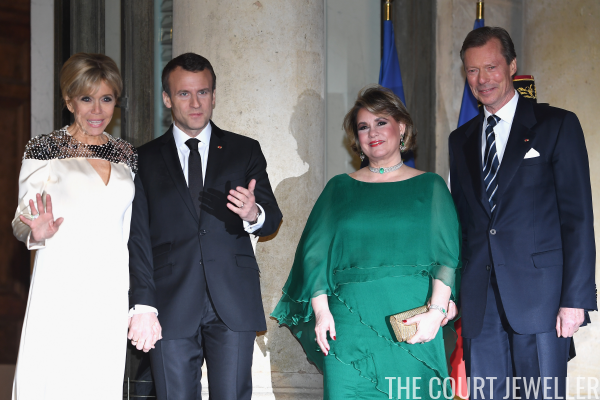 Unfortunately, white-tie/black-tie state dinners largely went out of favor in France years ago, so there were no tiaras to spot on this occasion. 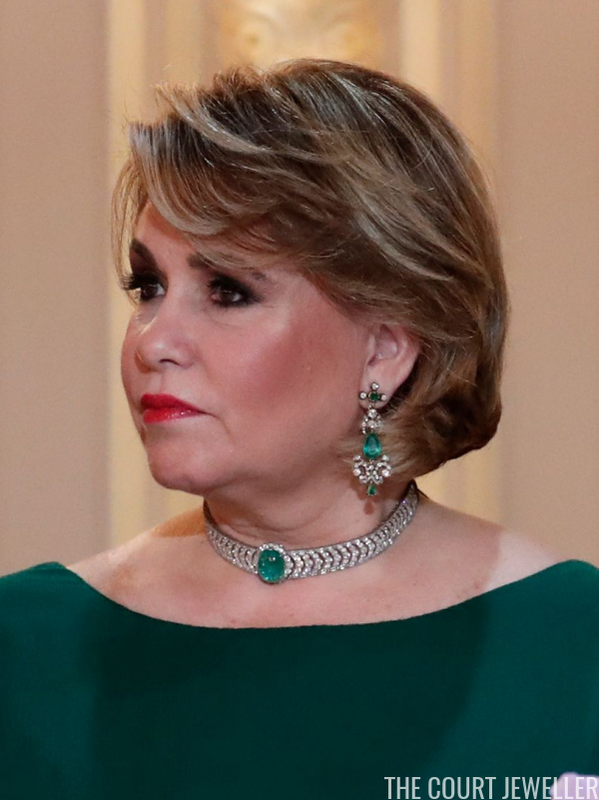 But Grand Duchess Maria Teresa did delve into the family's collection of diamond and emerald jewelry for the dinner, wearing the diamond and emerald choker necklace that belonged to Queen Astrid of Belgium. (I'll direct you to our friends at Luxarazzi for more on the necklace.) She paired the necklace, which can also be worn as a bracelet or a bandeau, with elaborate diamond and emerald earrings. 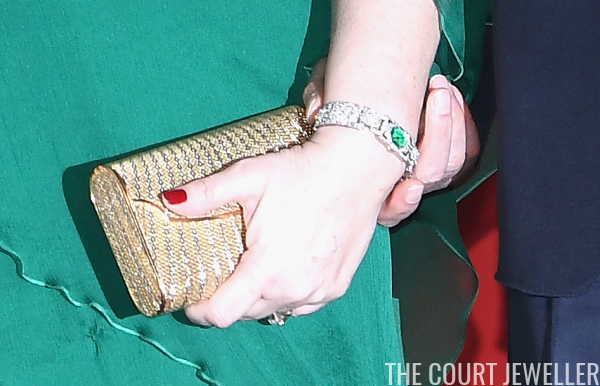 She also wore more diamonds and emeralds on her left wrist. From some angles, this bracelet looks like it might be a diamond and emerald evening watch. Brigitte Macron was especially chic for the dinner. Check out that cocktail ring on her left hand! Here's a look at the four major players' entire ensembles for the evening.